Want a Magic Toy Gift Surprising Your Kids and Make She or Him Happy Always? YES, magic water drawing mat, so much fun! Kids'happiness is all what matters to parents. With a pen filled water,kids love to doodle on this water drawing mat and observe how color changes and how doodle magically fade away and finally gone! Kids will doodle repeatly with much fun! Want Your Little Artists to Expand His Imagination but Mess Free? No Ink, No Paint, No Crayon, No Chemicals, Mess Free! Only natual clear water. Inspire your kids imagination and creativity, learn color, alphabet, numbers, composition picture for kids 2+ years at different stage. Kids like spending hours and No need any extra clearning, clean and tidy. Want to Better Communicate with Your Baby and Help Him to Build Friendship Easily? Doodle pad is not only a toy but also a communicative link between you and baby. Start now to know your baby inner world and his growth develpment by his doodle working on this doodle pad! Large size of mat,3 pens, easy to play with his 2-6 friends same time, team working beatiful picture & build friendship! Want A Toy Kids Can Play Both Indoor and Outdoor? YES, portable aqua magic mat easy go anywhere. This aqua magic mat can be folded to compact size. 1. NO Pen Caps to avoid danger of little parts. 2. Full Filled Water or Sock in Water 1 min before use. 1. Unscrew the nip in the direction of OPEN. 3. Tighten the nip in the direction of CLOSE. 【 LARGE SIZE 】 Size: 39.5 X 28 inch. Larger size than other sellers. Enough for a few children to play on our aquadoodle mat. It can be folded to compact size, portable for kids and toddlers play on indoor, outdoor and travel. 【 REUSABLE 】 Fill the pen with clean water and doodle on the magic mat. Magically disappear after 3-10 minutes (depending on the temperature and air flow), kids can doodle on water drawing mat again and again. Non-toxic, Non-polluting. 【 SAFE AND CLEAN 】 No ink, no paint, aquadoodle mat is clean and safe for children. Don't need to extra clean. The back of aquadoodle mat material is water-resistant nylon, don't worry about water leakage. 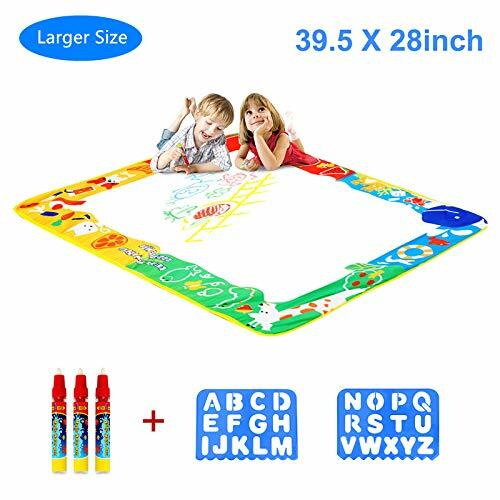 【 GREAT EDUCATIONAL GIFT 】 Large magic water drawing mat is not only a toy but also a communicative link between parent and child. Inspire your kid's creativity and imagination by aqua doodle mat, exercise hand-eye coordination & color perception. Aquadoodle mat is the best gift choice for kids. 【 SATISFACTION GUARANTEE 】 Niolio Aquadoodle Mat is backed with a three-month warranty and 100% Satisfaction Guarantee. If you are not satisfied with our aquadoodle mat, contact us for the full refund, so buy this amazing water doodle mat for your kids now! If you have any questions about this product by Niolio, contact us by completing and submitting the form below. If you are looking for a specif part number, please include it with your message.